Unbreakable was a slow burn of comic book movie and origin story. It took its time and was meticulous on every single detail. This was way before Marvel Universe came into existence but it still showed us what superhero movies can be and left us wanting more. And in the 19 years since, it’s only solidified that fact. It wasn’t until 2016’s Split ended that we found out that the character’s shared the same universe as those in Unbreakable. Split had its problems, but it benefitted from James McAvoy’s fantastic performance as Kevin Michael Crumb/The Beast. And when, at the end, the camera pans backward to show Bruce Willis as David Dunn sitting at a diner counter, it only amplified the hopes of what was to come. With Glass, the characters and story now become one. The Beast is still on the loose and David Dunn, with the help of his son, Joseph (Spencer Treat Clark), are on the hunt. Dunn, who’s now called The Overseer by various media outlets, quickly finds him holed up in an abandoned warehouse where he’s taken some young cheerleaders hostage. A fight ensues and it looks like The Overseer is about to win this battle. That is until they’re but swarmed by the authorities and taken to a psychiatric hospital, which also happens to be the current home of one Elijah Glass (Samuel L. Jackson). There they meet Dr. Ellie Staple (Sarah Paulson) who tries to convince the three that they are not superhuman, that their abilities are all in their head. From there, it becomes a battle to find out what’s real and what’s not. While at the same time, Glass forges ahead with his plan to escape and announce to the world that people with superhuman abilities actually do exist. The film is more graphic novel than pure comic book. 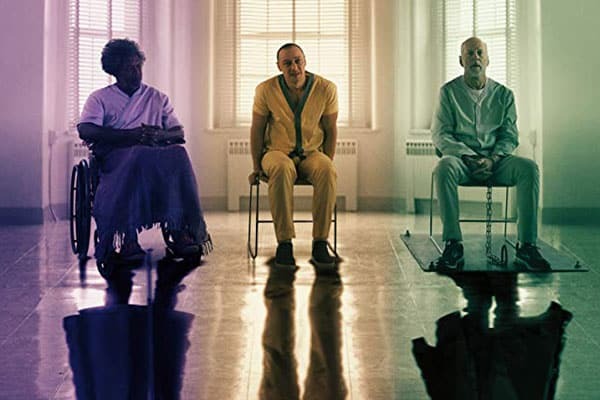 Writer/director M. Night Shyamalan wants to deal with what it’s like to be a human with super abilities and its effects on the world at large. It’s a great idea but the final product just leaves you wanting more. More fight scenes, specifically. And once we get to the psychiatric ward, that’s it. There’s really no other location which makes the film feel a bit more constrained. McAvoy is still brilliant in the role of Crumb/Beast, etc. There are moments where Shyamalan keeps the camera on his face as he effortlessly switches from personality to personality to personality, all in front of our eyes. And it’s nice to see Jackson back in a role that fits him like a glove, his performance is so layered and nuanced. As for Willis, he’s not giving a lot to do here. Once he gets locked up in the loony bin, Dunn is put on the back-burner and the film goes all-in on the Beast and Glass. Heck, the character Casey (Anya Taylor-Joy) from Split, she’s the young girl who escaped from the Beast, gets more screen time than Willis does. The ending of the film, the final battle, only makes the film feel even more disappointing.